Sign Supplies | Sign Supplier - Signworld America, Inc.
Online orders placed over the weekend will be processed the next business day. We offer same day shipping on most products without print, if you place your order before 12 Noon PST on a business day. Once payment is cleared, we will ship the product(s) within 2-5 business days depending on products and quantities purchased. A tracking number will be provided to the email address provided on the order when order is shipped. If you do not receive an email notice, we can be contacted to obtain the information. U.S. 48 Contiguous States Addresses: Orders will be shipped via UPS Ground service unless otherwise noted. We do not ship to P.O. Box addresses. Please provide a physical address and contact phone number in case the package is undeliverable. You, as the buyer, are responsible for all costs related to shipping back your items and that the item arrives to us without damage. Shipping charges will not be compensated for. Packages being returned should be insured by you for your protection. AK, HI, PR Addresses: Will be shipped via USPS Parcel Post service, please contact us if another method of shipping is preferred. California State sales tax must be added for California shipping addresses, unless exempt. We ship east coast order from Pennsylvania warehouse and west orders from California warehouse. 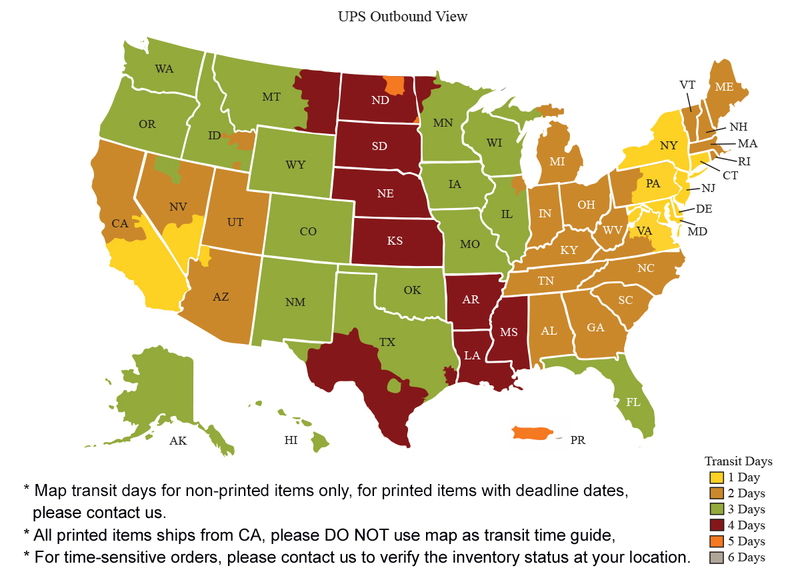 Not all items will follow our transit time map, please contact us for shipping transit time if there is a deadline. * After your order is processed and print-ready artwork is received, your order will ship 2-5 business days later (depending on print type) given there are no issues with your artwork and amount of prints ordered. If there are issues with your artwork, it will delay production and shipment of your order. If your need faster processing and/or have a deadline please call the order in. Delivery Service is available for local customers within 50 miles with a minimum $100 total order for next business day delivery.